If You Like Our Coffee, You’ll Love Our Logistics. That’s Right… Excuses Are For The Other Guys. When it comes to logistics, a reliable partner can be the difference between profits and losses. We take logistics seriously and go to extremes to get your beans on time. We have multiple warehouses across the country to make it convenient for you. Our team is constantly monitoring shipments, weather, and overall transportation schedules to keep you informed and fully supplied. We keep you stocked and stoked, not shocked and broke. In fact, if we can’t get you the beans you want from our own warehouses and suppliers, we’ll shop the world to get them from other warehouses and suppliers even if we make less money. You are our priority and we treat you like family whether it benefits us in the short-term or not. Efficiency Built Into Every Order. Our process for getting you the highest quality beans in the shortest amount of time is built on decades of experience blended with the latest technologies. Add to this our intuition and innate ability to predict delays before they exist makes us one of the best. Sprinkle in our discipline to constantly monitor and oversee production and transportation and you’ll understand why our clients stay with us for so many years. No One Likes Getting Their Coffee Late. Expert Logistics Means Happy Customers… We Get That. 11 AM Pacific Time. ICT suggests that you plan your purchases as far in advance as possible to minimize the impact of unforeseen delays. Please be diligent in inspecting all deliveries for accuracy and condition before the driver leaves your facility. Please make certain to note any damages on your delivery documents. This is required for the processing of any claims. Once the delivery order and invoice are issued, you own the coffee. ICT has no legal responsibility for the coffee once the documents are issued. Once documents are issued, the invoice amount is due in full even if there are damages or discrepancies due to shipping. All claims relating to missing or damaged goods must be filed with the shipping company. ICT is not responsible for any loss or damages. We are always available to assist you in filing a claim. For a walk-through of the claims process, please visit our FAQ Page. *Please note that after the delivery order and invoice is issued, the buyer is titled to the coffee and assumes all liabilities attached to ownership. ICT Coffee has no legal claim or responsibility for the goods. Definition: The coffee changes ownership at the warehouse or upon transfer of ownership at a shared warehouse. Definition: Risk and ownership is transferred at the ship rail point. Definition: Sellers price includes warehouse in-loading and out-loading charges but not transport from the warehouse to the buyer. Definition: Freight is paid for by the seller to the point specified above. Risk is transferred at that point. CIF: the seller also paid for insurance and that is included in the price. All generally related to FOB purchases. Definition: An order is placed for the specified coffee and both parties create a binding contract to purchase it, however it is based on the buyer’s approval of the sample. Definition: On average the seller takes a random sample from about 10% of the bags, blends them and creates one large sample. Definition: A representative sample taken from after milling is complete and the coffee is ready to ship. A randomly chosen sample from 10% of the bags, blended and then sent to the buyer to grade, roast and cup and approve. Definition: The coffee has arrived at its final warehouse location in the country of consumption. Definition: When applied to SAS coffees, specifies whether the buyer is agreeing to replace the coffee with another equal value coffee or not. "Thanks for always providing such great service and terrific specialty coffee. We really like the futures number being so visible and the harvest months for each regional coffee are also very helpful in planning our future orders. Always a pleasure to work with your team and can’t imagine ordering our coffee anywhere else! Thanks, again!" "Intercontinental Coffee Trading Inc. is always such a pleasure to work with! Thanks for your great service!" "ICT is a great company to work with. 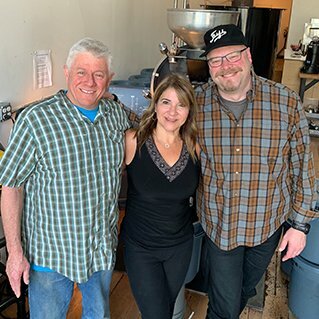 I am a small roaster and they treat me like a big guy. Folks are friendly and informative. Orders are always placed and shipped right away. I love you guys for great product now great new website. Keep up the great work. Thank you for serving customers of all sizes." "I have thoroughly enjoyed working with Lisa Colon and ICT for the past years. They are attentive to detail and quality! Anything we want or need to know about the coffees we buy from them, they help us with. They go the extra mile to get the job done for us! There quality has been excellent! Thanks for the great Service!"